Get the best of both worlds. These unique drop cloths combine a top layer of canvas that captures, absorbs and promotes drying of paint spills or splatters as it is trapped within the weave structure. A second unique bottom layer of NON SLIP polypropylene laminate provides 100% leak proof protection and stays put. Avoid a mess before it happens by using these professional quality grade drop cloths. Great for use in home painting projects. This clear polyethylene drop cloth provides protection for floors, furniture, walls and windows. At 9 ft. x 12 ft., this 2 mil thick clear plastic cloth is lightweight and tough enough to withstand foot traffic. 2.74m x 3.66m .46kg. When tackling those painting or home improvement projects, protect your home interiors with the Canvas Drop Cloth from Everbilt. It also enables protection for all types of flooring, furniture, cabinets, countertops, appliances and more. The super absorbent and rot-resistant fabric is perfect for capturing spills, drips or splatter from paint. It's durable fabric construction is washable and reusable for long-lasting wear. Whatever the task: from household and office clean-up; to car cleaning, oil changes, painting, renovating or repair projects the 100% cotton shop towel should always be close at hand for all your cleaning needs. These strong, absorbent and reusable cleaning cloths outperform paper towels and are far more economical than other synthetic cloths in their class. 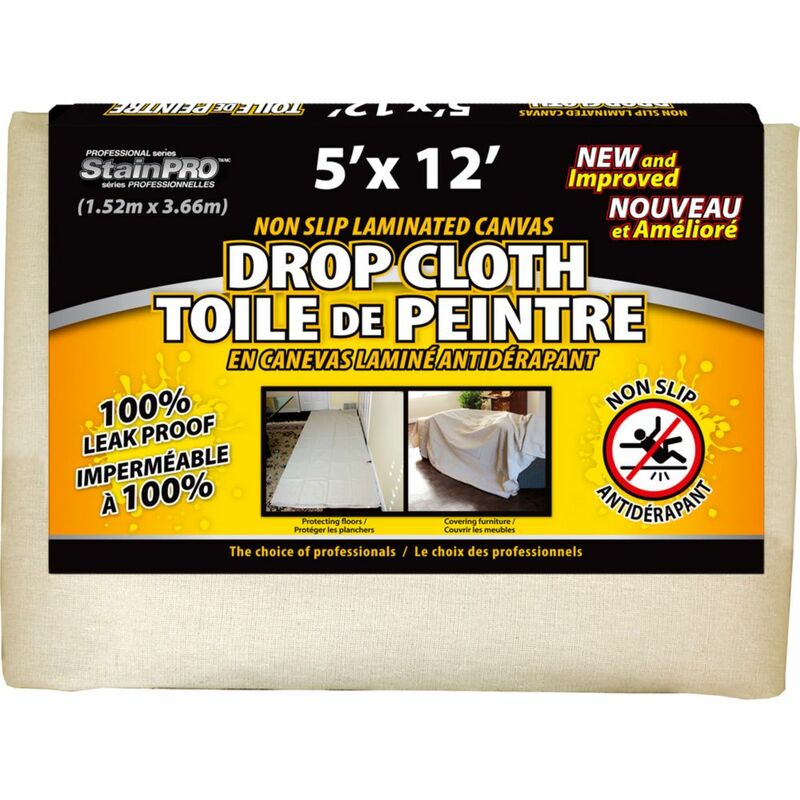 Non Slip Laminated Canvas Drop Cloth 5 Feet x 12 Feet - 4 pack Get the best of both worlds. These unique drop cloths combine a top layer of canvas that captures, absorbs and promotes drying of paint spills or splatters as it is trapped within the weave structure. A second unique bottom layer of NON SLIP polypropylene laminate provides 100% leak proof protection and stays put. Avoid a mess before it happens by using these professional quality grade drop cloths. Non Slip Laminated Canvas Drop Cloth 5 Feet x 12 Feet - 4 pack is rated 4.0 out of 5 by 4. Rated 5 out of 5 by Hanker514 from Drop Cloth Exactly what I expected. Perfect for my work! Useful. Rated 4 out of 5 by Vick from Great product Bought this over the summer.great on hard wood and tiles, no slipping. Rated 5 out of 5 by HFree from Nice thick material and plastic backing These drop cloths were a lifesaver when we painted our whole house. The plastic backing kept paint spills from seeping through to the floor, and were worth the investment. Thank you for your inquiry. No theses drop cloths are not machine washable, due to the plastic laminate backing that can become unglued.